Lots to report over the past couple days! Here's a round-up of some of our sightings on the bank. July 9: We headed out and came into some very thick fog. After searching and listening for whales, the fog cleared and we sighted Nile in the distance. As we approached she actually displayed some wonderful full body breaches. She lifted almost her whole body vertically out of the water before crashing down. 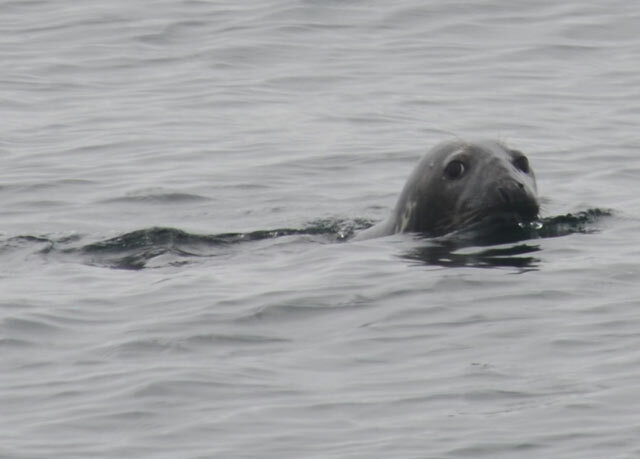 That afternoon we also managed to catch a glimpse of a grey seal as we left the area. A great treat for the passengers to see two marine mammal species. 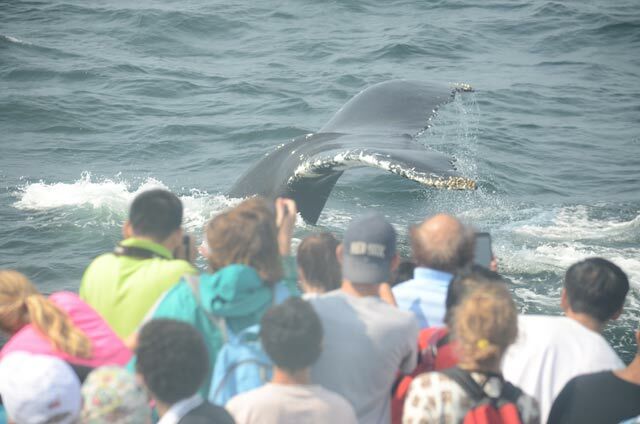 July 10: Nile took a dive right in front of our boat, causing lots of ooo’s and ahhh’s from our passengers. She continued to surface with bubbles and water pouring out of her mouth over and over again. It must have been a great day for surprise close encounters because when we headed home, we had a minke surface just in front of us. 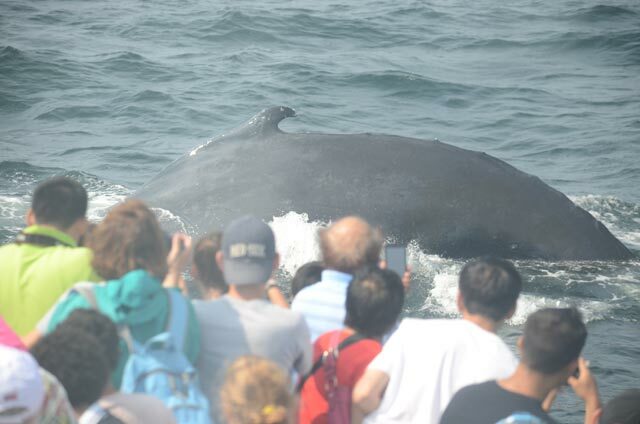 Both of our whales gave people a day out on the water that they would never forget! This perspective really gives you a great reference point to gauge just how large these animals are. July 11: We traveled to the northern edge of Stellwagen Bank where we found two minke whales. 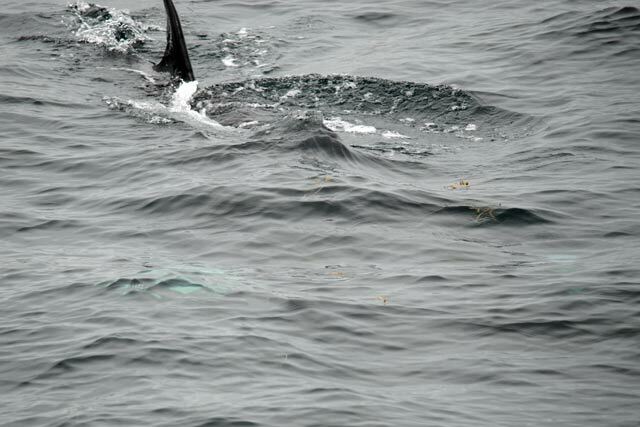 At one point during the trip, one of the minke whales got quite close to the boat. Passengers got a great look at the distinct white patches on the minke’s pectoral flippers, better known as minke mittens. The white patches give off a green glow underwater due to the abundance of phytoplankton in the ocean. Passengers were also treated to five different species of seabirds out on the bank today: greater shearwaters, Wilson’s storm petrels, Northern gannets, herring gulls and black-backed gulls. 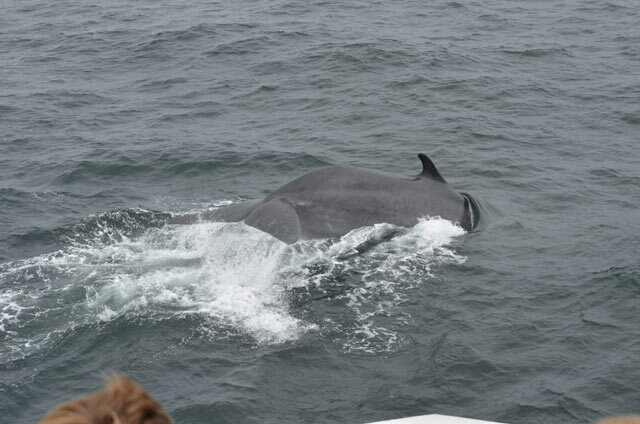 July 12: We found two fin whales about a mile off of Provincetown today. One of the whale swam right next to our boat and FLUKED! I had just finished telling passengers that fin whales do not fluke (or bring their tails up out of the water) when it took a dive and lifted its tail out of the water. I have never been so happy to be proven wrong. 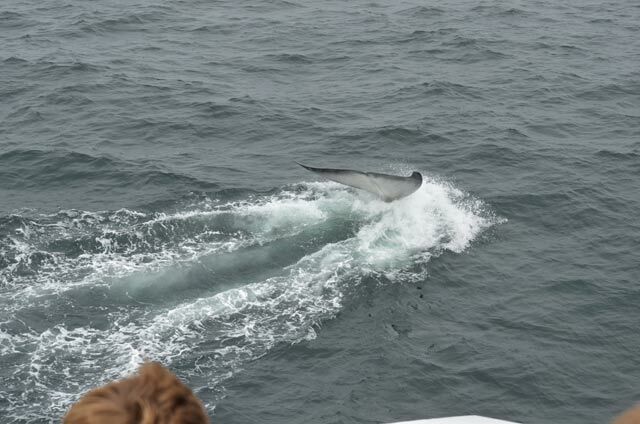 Our captain even said that in 30 years he has never seen a fin whale do that! We also saw two seals and a minke whale breach three times in the distance on the way home, but nothing compared to the amazing looks that our fin whale gave us.